Phil Kessel is finally playing like the player the Boston Bruins envisioned when they drafted him with the fifth pick in the 2006 NHL Entry Draft. Kessel has started the year on fire for the Bruins, with six goals and one assist in the teams first 10 games, helping the B’s off to a 5-2-3 start. However, in this instance, the points don’t tell the whole story. He’s been a constant threat to opposing teams, buzzing around the ice like a hedgehog, providing the B’s with a spark, striking fear in teams across the NHL. Pretty good praise for a player management, and most fans for that matter, thought about trading a few times over the course of his first two seasons. Kessel has always had the skill. His speed, quickness, hockey instinct, and shot have never been a question for coaches and scouts. However, his heart and desire to play, especially in the hard hitting NHL, have been questioned since his freshman year at the University of Minnesota. Remember, just last year, in the first round of the playoffs, Kessel was benched for the first three games. After watching those first three games in street cloths, Kessel came on-and came on strong, scoring four points (three goals-one assist) helping the Bruins take the top seeded Montreal Canadiens to the brink of elimination. This year, he has picked up right where he left in the playoffs last year. Every since the benching, Kessel has been a man on a mission, playing like a young superstar, not a first round flame-out. 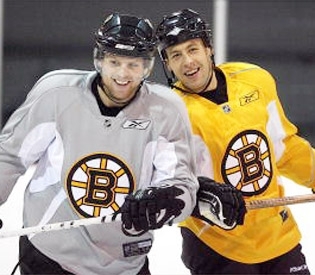 If this up-and-coming Bruins squad wants to do some damage in the eastern Conference this year, they need to get consistent results from Kessel-as well as other young stars like Milan Lucic, David Krejci, and Patrice Bergeron. If Kessel keeps playing like this, the B’s will be a serious threat for any Eastern Conference foe.